To understand Hamlet, Johnson explains, is to gain insight into the emptiness and loneliness of modern existential life. As a three-dimensional man, Hamlet has neither roots in the instinctive world nor is his head yet in the heavens where he might gain enlightenment. Modern man, in general, is at a point where he must heal the paradox of masculine and feminine,doing and being. Johnson says that Hamlet only touches this design state before making division and tragedy, rather than paradox and synthesis, of it. Because time and again, in refusing to act and make a choice, Hamlet loses the value of both. Hamlet’s troubles begin with the murder of his father by his uncle who then marries Hamlet’s mother. 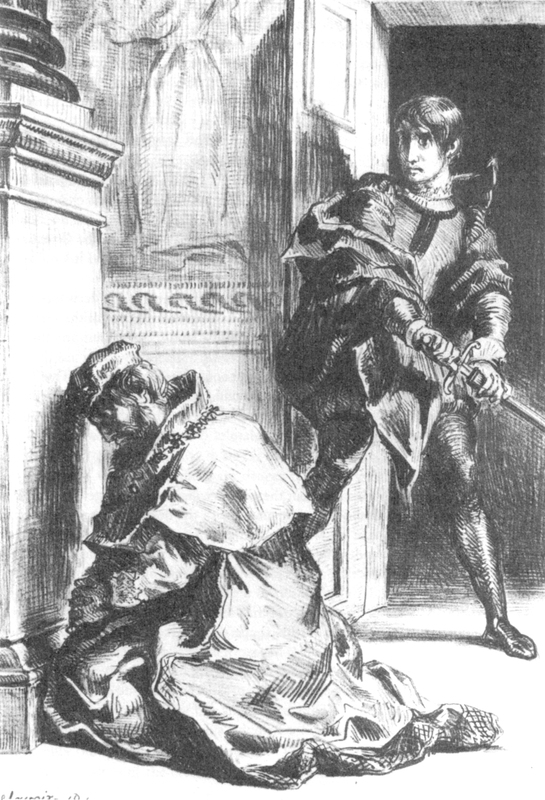 The ghost of Hamlet’s father tells him to take revenge and thus begins the internal debate–to kill the uncle and take his rightful place as king or decide that enough blood has been shed and be at peace with what has happened. Instead he does as Emily Dickinson put it,”wavered for us all.” Vacillation in one of the characteristics of the three-dimensional man. “A thought which, quartered, hath but one part wisdom and ever three parts coward,” Hamlet thinks. He can see that together the four parts make for wholeness, but only three parts function for him. He cannot listen to his internal wisdom. Johnson explains that this is the despair that causes conflict in every three-dimensional man–while he cannot live, he dare not die. He then begins to torture everyone around him, especially those who love him, and he makes life unbearable for himself. When challenged about what he is doing, Hamlet cries, “Words, words, words.” It is the cry of the three-dimensional man who is so caught up in words he cannot act. As I recently noted, when the universe speaks to me in stereo, I try to listen. So, as I am working my way through the remaining codon rings in Gene Keys by Richard Rudd, I discovered the next on my list was the 9th Gene Key. Coincidentally (God-incidentally), that was my hexagram that morning at Tarot.com. 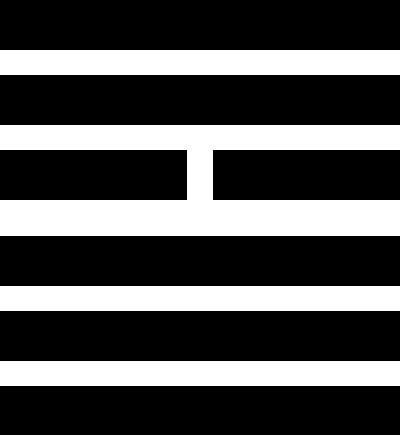 The 64 Gene Keys being not dissimilar from the 64 I-Ching Hexagrams, I knew that this was something to which I needed to pay closer attention. No matter what you choose to title the 9th–The Power of the Infinitesimal, The Taming of the Power of the Small or even Small Influences–it all comes down to our tendency, as humans, to completely immerse ourselves in the trivial, and often irrelevant, details of life. For example, anyone who watches “reality” television (an oxymoron if I ever heard one) will find themselves wallowing in this Shadow aspect of the 9th Gene Key. In this case the trivial is anything that is neither beautiful nor practical. To move beyond this Shadow of Inertia, one must apply one’s energy only to those things that serve a higher purpose in one’s life. Lao Tzu is credited with saying, “The journey of a thousand miles begins with the first step.” Rudd says a more accurate translation is: The journey of a thousand miles begins beneath one’s feet. As always, our focus should be on what lies right in front of us rather than on the future or past–always living in the present moment. Rudd says an excellent image of this, for both the Shadow of Inertia and the Gift of Determination, is a pathway constructed of stepping stones. If you are lost in the Shadow, then those stones will form a never-ending circle and you may never realize that not only are you not going anywhere, you are wasting all your energy. 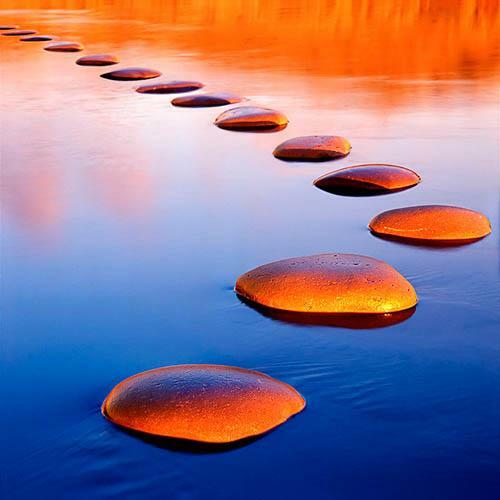 At the Gift level, however, the stepping stones form a path that continues forward and you lose sight of those stones once they reach the horizon. But, it doesn’t matter. Because, not only do you not care where they are going, you find a sense of excitement in the mystery and adventure of moving ahead one step at a time. Once you realize this sense of adventure, even the quotidian aspects of life become fulfilling because they all lead you, one step at a time, in the direction of your dream. Without this sense of inner focus, Rudd says, a great deal of energy goes into complaining, whether vocally or mentally. This Gift of Determination is built on the rock of the very smallest of acts, he says. As Aleister Crowley noted, “Every intentional act is a magical act.” Once you break away from the trivia of the Shadow and connect with your vision or ideal as a feeling and a knowing deep inside, Rudd says, you have truly begun the journey of a thousand steps. From then on, every single step you take, no matter how mundane it seems, will lead in the direction of your dream, the direction your heart is taking you. And the more you allow every step to fulfill you, the easier the path becomes and the less energy and willpower you must use. Then you tame life instead of allowing it to tame you. 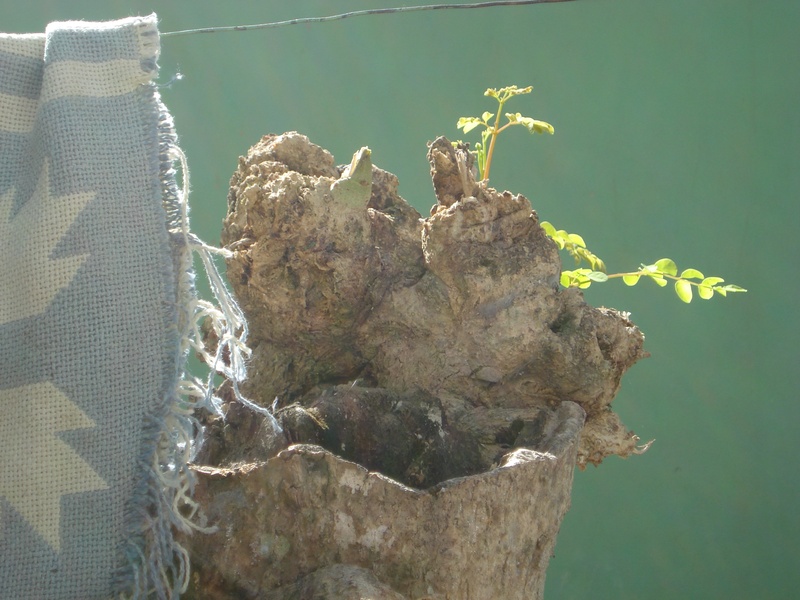 The endpoint of this path is the Siddhi of Invincibility or the power of the infinitesimal. According to Rudd, the infinitesimal is also paradoxical. For, if one, for example, goes on dividing a piece of string in half, one could theoretically go on forever and thus it becomes boundless and inner space leads to outer space, and you become invincible and invisible. And, the only force is the universe that is truly invincible is love. And that is always what everything comes down to–LOVE. I keep putting off writing this, but when my horoscope said recently, “Live with the paradox of knowing that everything is okay and not okay at the very same time,” it seemed very apropos. It was one of my Zen Transformation cards that set me to pondering the paradox of opposites—the fact that where opposites are involved, there cannot be one without the other. That is, there is no darkness without light, good without evil, etc. Actually, I think they can meet, but they can never be more than acquaintances. We can introduce ourselves to death and come to terms with it as a fact of life. We will all die. When the sun sets at night, we know that it will rise again in the morning despite the fact the darkness seems unending at the time, and when the trees lose their leaves in the fall, we know that they will return with the spring. When we work toward wholeness in the process of individuation, we must work with reconciling those opposites, the paradox within our selves. “The metaphysical process is known to the psychology of the unconscious as the individuation process. In so far as this process, as a rule, runs its course unconsciously as it has from time immemorial, it means no more than that the acorn becomes an oak, the calf a cow, and the child an adult. But if the individuation process is made conscious, consciousness must confront the unconscious and a balance between the opposites must be found. As this is not possible through logic, one is dependent on symbols which make the irrational union of opposites possible. They are produced spontaneously by the unconscious and are amplified by the conscious mind. “The difference between the ‘natural’ individuation process, which runs its course unconsciously, and the one which is consciously realized, is tremendous. In the first case consciousness nowhere intervenes; the end remains as dark as the beginning. In the second case so much darkness comes to light that the personality is permeated with light, and the consciousness necessarily gains in scope and insight. The encounter between conscious and unconscious has to ensure that the light which shines in the darkness is not only comprehended by the darkness, but comprehends it. The filius solis et lunae is the symbol of the union of opposites as well as the catalyst of their union. It is the alpha and omega of the process, the mediator and intermedius. ‘It has a thousand names,’ say the alchemists, meaning the source from which the individuation process rises and the goal towards which it aims is nameless, ineffable. “But empirically is can be established, with a sufficient degree of probability, that there is in the unconscious an archetype of wholeness which manifests itself spontaneously in dreams, etc., and a tendency, independent of the conscious will, to relate other archetypes to this centre. Consequently, it does not seem improbable that the archetype of wholeness occupies as such a central position which approximates it to the God-image. The similarity is further borne out by the peculiar fact that the archetype produces a symbolism which has always characterized and expressed the Deity. “The religious need longs for wholeness, and therefore lays hold of the images of wholeness offered by the unconscious, which, independently of the conscious mind, rise up from the depths of our psychic nature.